Thanks to all for your encouragement yesterday! Sorry for being such a Debbie Downer. Guess we all have our weak moments. I don’t usually get political on here, but Congress is going to vote any day nowon something I am passionate about. The DREAM Act (Development, Relief and Education for Alien Minors Act) will give children of illegal immigrants a chance to become US citizens through attending college or joining the armed forces. These are immigrants who were brough to the US as very young children. They have no control over the fact that they are illegal. Many of these kids want to attend college, but can’t because they cannot get any kind of financial aid – no government aid, and also no scholarships offered by any college or university. I have taught many of these kids. It is heartbreaking to see a passionate, intelligent young person who would make such a difference not be able to attend college because of their legal status. And I have seen it happen. They end up working low-wage, dead-end jobs if any. They have no future if they remain illegal immigrants. If the DREAM Act passes, these kids will be able to receive financial aid in the form of loans, grants, and scholarships. It would also put them on the path to citizenship. We should not punish these kids for what their parents did. None of the kids I’ve worked with want to go back to their home country. They all want to stay and contribute to the society, economy, workforce, and culture of the US, which they now consider their home. If you are in Tennessee, you can use the number below to call your Senators and Representatives and urge them to vote for the DREAM Act! Call 1.866.587.3023. Use this one phone number to call our Members of Congress and ask them to vote YES on the DREAM Act. Click here to find the number or email of your Representatives. Click here to find the number or email of your Senators. 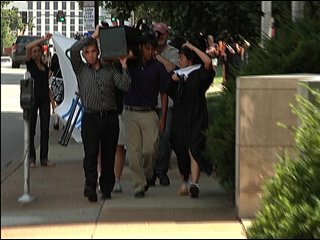 Immigrant students carry a coffin full of college diplomas, transcripts, and awards to represent the death of their dreams and to encourage the passing of the DREAM ACT to help educate children of illegal immigrants.